Will they bring in another male co-host - or will Fearne be left on her own? Unless I'm mistaken, only once since 1978 has the Christmas Pops been hosted solo - and that, of course, was in 2003 with Tim Kash. Am I the only to think we'll see a Greg James sized parachute here..? Clara Amfo is to replace Reggie, co presenting with Fearne. Watching last night it was interesting to see how it had changed from the first couple episodes, presumably responding to audience feedback. There were a lot more performances, often with minimal (filler) chat between the performances. Judging on this week and the first half of last week's show (missed the 2nd half) the only feature now between performances involves that week's guest host. It looks like it's been recommissioned, as they said they'd be back in the spring. So this year's Christmas Pops will be the first with an all-female hosting line-up since 1997. 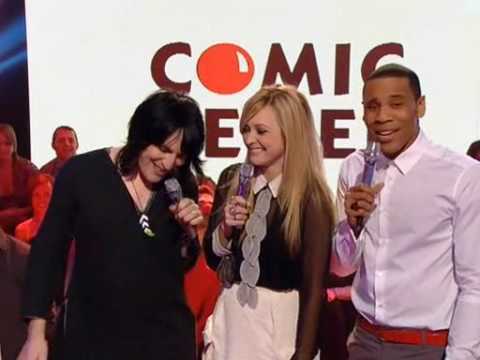 Zoe Ball, Jo Whiley and Jayne Middlemiss were the hosts that year, for the record. Clara is apparently "the first new presenter in well over a decade". The guest hosts during the regular show's dying days on BBC2 obviously don't count. I need a walking stick - pronto!